I’ll be at Pioneer Park in the Bear Gallery (3rd floor, Alaska Centennial Center for the Arts) from noon-8 today for the First Friday opening of Cartoon North II. There’s sequential art on the walls from dozens of artists, some of whom will also have tables at the opening selling books, prints, cards, and so forth. I’ll be there with Freebird and Kismet! Art show will be up all month! Later plans for the year are still slightly tentative. At the UWA show I will be sharing a table with Ellen Million of Ellen Million Graphics. I’ll be at Gulliver’s Books tonight from 7-9 p.m.! I’m giving a short talk at 7 p.m. about the book, and then signing afterwards. On Saturday from 2-4, I have another signing at Forget-Me-Not books (the bookstore division of the Literacy Council). And you can still sign up to win a free book until midnight; I will choose a winner tomorrow! In other news, it’s -20 and doesn’t seem to be warming up today. WOE. I did stop by the optician to get a long-overdue glasses adjustment, so I no longer look like I ran face-first into a telephone pole. In yet other news, if you enjoy clever takes on fairy tales, I really can’t recommend the show Once Upon a Time highly enough! I just marathoned the first season this past week while I was painting and working on holiday gifts, and it’s wonderful. For those of you in Fairbanks, there are several places around town where I’m going to be signing and selling books in the next few weeks. It’s almost like a book tour! A very small tour. In one town. Yep. Sat. & Sun, Nov. 24 & 25 – Fox Lions Club Holiday Bazaar – 10 a.m.-5 p.m. This is a small local bazaar … and I do mean local; it’s at the Fox Lions Community Center, which is only a mile up the highway from me. I’ll have a table on both Saturday and Sunday. Wed, Nov. 28 – Gulliver’s Books – 7-9 p.m. 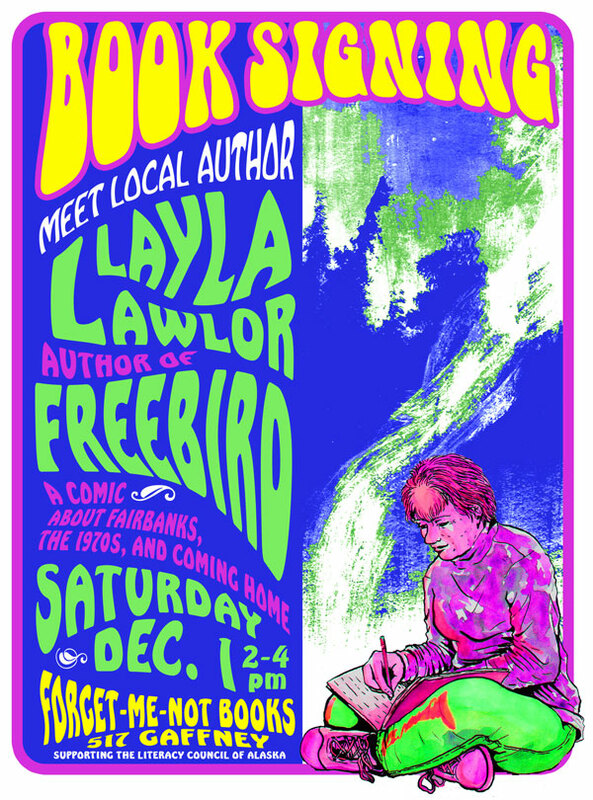 In addition to signing books, I will also be giving a short talk, probably something to do with comics. (Yeah, I really need to figure that part out.) The talk will be upstairs in the cafe. Sat, Dec. 1 – Forget-Me-Not Books – 2-4 p.m.
Forget-Me-Not is the used bookstore attached to the Literacy Council, so a portion of proceeds will be going to support the Literacy Council. There is a really groovy flyer. There’s also a completely insane part of me that’s thinking about calling the McKinley Holiday Bazaar people tomorrow and seeing if it’s possible to get table space on Saturday. Advantage: I’d probably have a lot of fun. Disadvantage: it’s in Denali Park, which is about a 2 1/2 hour drive from here (each way). And I have no idea if I’d actually manage to sell any books, which would make it a really silly way to spend my Saturday if I don’t sell a thing. Happy Halloween, everyone! I carved my last two home-grown pumpkins and put one of them out in the snow after dark, with a candle inside. It looks AWESOME. I can see why jack’o'lanterns would have been such a cool thing in the days before electric lights and TV. Doesn’t photograph worth a damn, though. I will definitely be doing a signing for The Comic Shop, but don’t have a date for that yet; I’ll announce it when I know more!